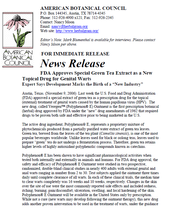 marking the second time a botanical has received drug approval from the Administration. 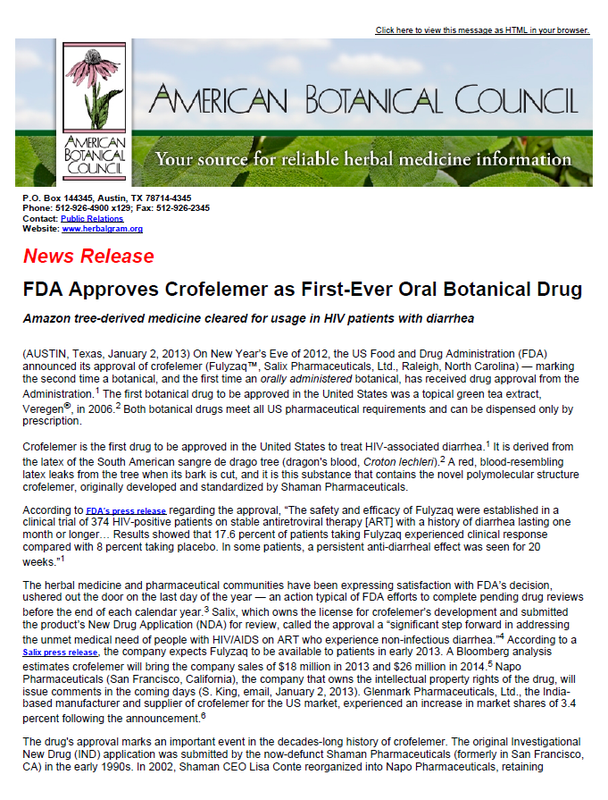 "Crofelemer is the first drug to be approved in the United States to treat HIV associated diarrhea. It is derived from the latex of the South American sangre de drago tree (dragon's blood, Croton lechleri). A red, bloodresembling latex leaks from the tree when its bark is cut, and it is this substance that contains the novel polymolecular structure crofelemer, originally developed and standardized by Shaman Pharmaceuticals." "Freddie Ann Hoffman, MD, an expert on this botanical drug process, said, “A new drug industry has just been born -- perhaps ‘reborn’ -- in the United States: the polymolecular botanical drug industry.” Dr. Hoffman is a former FDA official and is founder of HeteroGeneity, LLC, a Washington, D.C.-based consulting firm advising companies seeking to market botanically-based drugs."